Our premium mattresses protector are resistant to dust mites, water, urine, sweat, bacteria, allergens, etc., suitable for people with children, pets, allergies, asthma, eczema or urinary incontinence. Our high quality mattresses protector help keep your mattress clean and provide you and your family with a healthy and comfortable sleep environment. This mattress protector is made of 100% cotton terry cloth, thin, light, cool and breathable. The cotton material can absorb moisture to keep the mattress dry. Luxurious and comfortable sleep experience. Our waterproof mattress protector is like a bed sheet,has a "14"inch deep pocket to ensure that it is firmly attached to most mattresse. A widened, full-length rubber band design ensure automatically pull the excess material under the mattress. It is easy to put on and remove for washing. Our mattress protector is made of 100% cotton terry cloth surface that will not change the feel of your mattress. The soft, quiet, and comfortable texture warrants a nightlong sound sleep. It is worth mentioning that the mattress protector does not contain phthalates, vinyl or PVCs. Machine wash with your sheets using normal household detergents that do not contain bleach. Tumble dry on low heat. Do not iron or dry clean. If you are not satisfied with the product, as long as the product are also brand new and can be sold again, we promise to return the refund without questions. 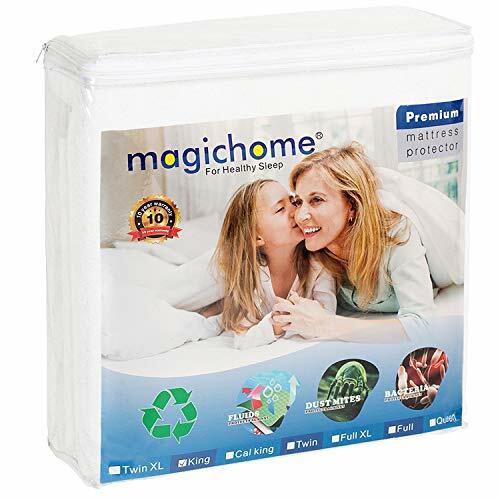 If you have any questions about this product by Magichome, contact us by completing and submitting the form below. If you are looking for a specif part number, please include it with your message. New Generation Go Alive TIGER Velvet Jigsaw Puzzle: Top Kit of 15”x19” Coloring Puzzle + Washable Markers| Augmented Reality Velvet Puzzle That Go 3D On Your Smartphone| Great Gifting idea.